Tanja Möderscheim is a Dutch painter based in London. She works in a classical style using traditional technique. Her close attention to detail and anatomy, nurtured by her background in science, is a nod to the interest in taxonomy during the Dutch Golden Age. 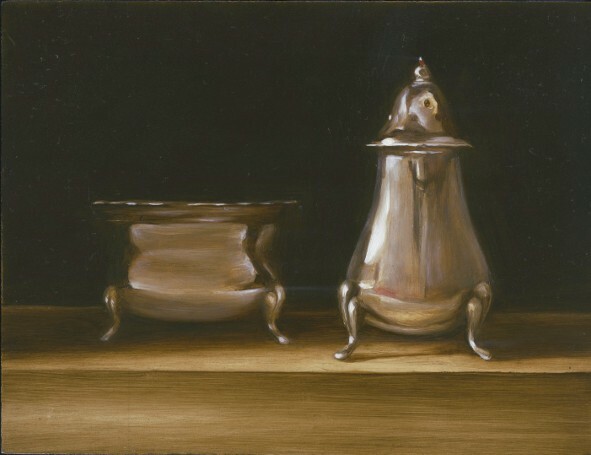 Her still life paintings are simple and calm. She divides her time between painting commissioned pieces, painting for exhibitions and working on ongoing projects: cultural and culinary heritage. Her cultural heritage project focuses on Dutch historical tulips from the 16th to 19th centuries. 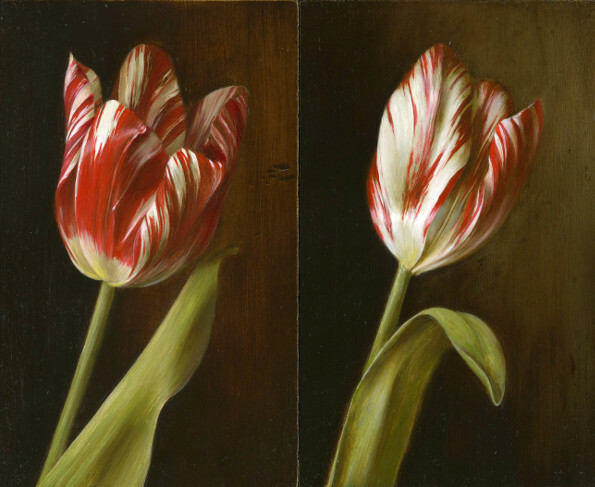 She sources the bulbs from the gene bank Hortus Bulborum in Holland and grows these in her garden, resulting in annual series of tulip paintings. Go to the tulip page to read more about this project. Her culinary heritage project is about celebrating artisan and local food produce. As part of this she collaborated with the BBC Food and Farming Awards and is currently working with chef Lise of Bon Fond, painting the produce of French artisans. She brings out the best of the artisans’ products in her paintings. Read more about this project on the Culinary heritage project page. Another series of paintings focuses on archeological finds, Roman pottery in particular. Key exhibitions include the Mall Galleries, London (RBA, SWA, SBA) and Affordable Art Fair (Otomys Gallery). For upcoming exhibitions please scroll down or visit the exhibition page. Paintings currently for sale: available paintings. For enquiries including commissions or just to have a chat please email artist@dutchoils.com or use the contact form. The latest news is shown below. Tulips may only flower in April to May but it’s always tulip painting season in the studio. 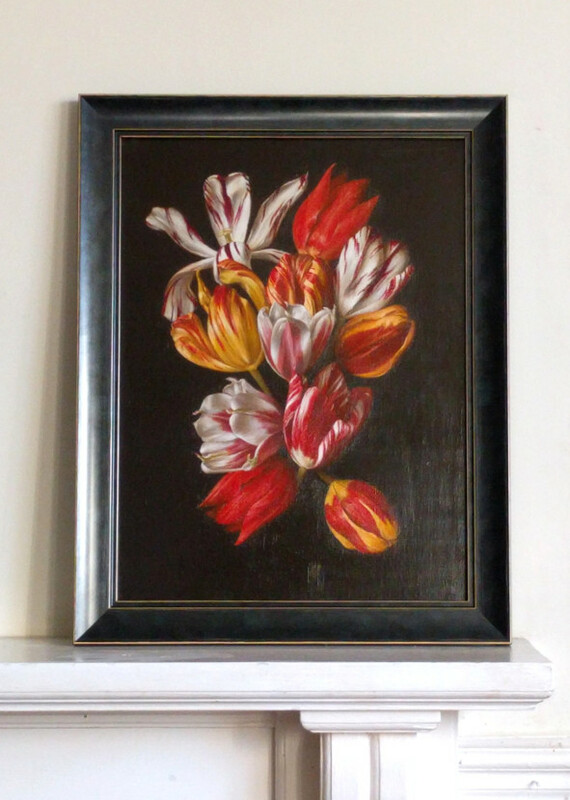 Ideally using live flowers during the flowering season, but later in the year using her photo library, Tanja’s paintings feature Dutch heirloom tulips spanning the 16th to the 19th centuries. She grows the tulips from bulbs sourced from the gene bank Hortus Bulborum, Holland. One tulip painting has been selected for exhibition with the Society of Botanical Artists, Mall Galleries London. The exhibition will run from 5-9 June 2019. Read more about the historical Dutch tulip project here. For the next chapter in her culinary heritage project, Tanja has started a collaboration with chefs Lise and Eric of BonFond. Lise and Eric travel to ‘discover the abundance of France through sustainable farming and French savoir-faire’. 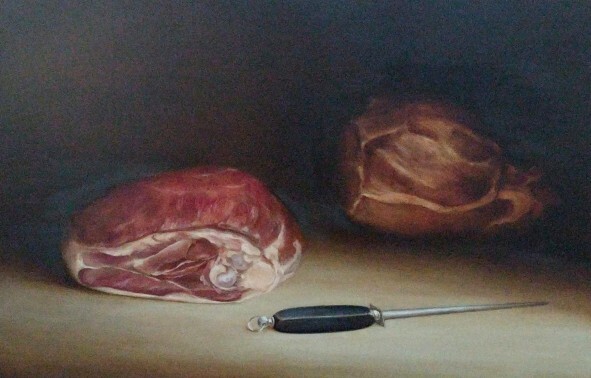 As a celebration of the artisans they meet, a new series of oil paintings will showcase their produce, starting with Breton pig from Charcuterie Hélibert, a top-20 charcutier in France. Other planned paintings include southern French pastries, Mount St Michel Bay oysters, Corsican chicken and Loire Valley vegetables. Below is a detail of the progress of the first painting, Charcuterie Hélibert. Read more about this project on the Culinary heritage project page. Below is the first painting in a new series featuring Roman pottery: two black slip ware bowls dating to the second century AD. These bowls were produced in north-west Europe. The latest painting exploring the abstract forms of silver objects; use the contact form to enquire/reserve. For available works see the listing of currently available paintings. Dutch Oils Art also feature monthly in House and Garden and recently in World of Interiors. Proudly supporting the charity Environment Trust, Richmond and the Grenfell Tower Appeal.